I've got this mid-80's Peugeot that needs a drop bar. The stem is 22.0mm into the headtube, 25.4 clamp. I've got two modern drop bars, both 26.0 clamp. One came with an Easton threadless stem. I thought I'd use a stem adapter with the Easton stem until I remembered the 22.0mm problem. Btw, I forced a 22.2 stem into another Peugeot once (a battle! ), before someone enlightened me about Peugeot stems. It has since been removed. 1) I seem to remember reading that Sheldon says you can remove 0.2mm of material and make a 22.2mm stem work. Anyone ever successfully try this? And how - sandpaper? Don't have a grinding wheel. 2) Using the existing stem would look better. Anyone know an online source for a 25.4mm drop bar, ideally with ergonomic bends (40-42 wide)? I haven't been able find one. Search for some - try eBay. And welcome to France! At least we know it's a gen-U-wine Peugeot! I'd be checking for a stem-converter that could be 'made' to fit the headtube. And a stem that will attach to this - and throw my predilection for a 25.4mm handlebar out the window. Most good & strong 'anatomic' bars these days are 31.8mm. But good luck - try eBay. I have a very nice triple-butted Ritchey WCS anatomic handlebar. Had to use a stem-converter to attach it. It was worth the run-around to accomplish. Stem can be sanded down, no big deal. Maybe use the 400 wet type. I tend to open the screw in the front a bit more than normal, put a flat screwdriver in the slot and twist.. This way you can put a slightly wider tube (handlebar mid section) in there. If you do not like that approach then maybe glue sand paper to a dowel and sand down the hole. Could be difficult to make the hole accurate. Badmother's nailed it. Simply sand the old main mast here, you're looking at removing about 0.007 - 0.008" of material. There are plenty of dropbars that will fit a 25.4 clamp, Nitto Randos and On-One Midge bars for one. Or you could go with some Moustache bars. Personally, I've been running quill / bar mismatches for years without problems. I actually bought one of these (26mm clamp), at a swap meet recently. It's the one wth the Easton stem I mentioned. I figured I'd use a stem adapter until I remembered the "french problem." 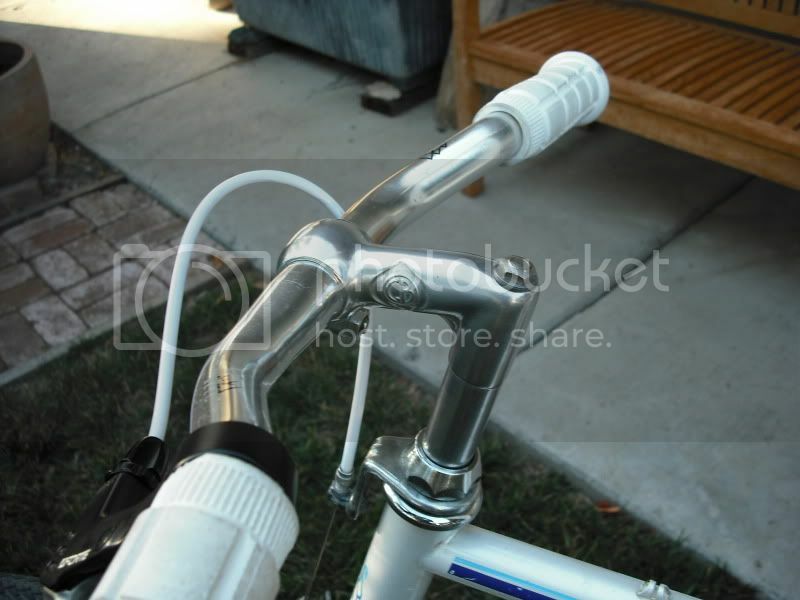 I know this is a bend that works well for my son because he has a Ritchey Pro (31.8) on his "good" bike. At any rate, this Peugeot is a semi-beater, having seen some hard use before I got it for $30, so I don't want to go overboard on cost. Interesting suggestions. I've got a Midge on my touring bike and I liked it initially, but it's not really working for me now, and I can't figure out why. My son was interested in it at one time, so it may end up on the Peugeot. Coincidentally, I was trying to get the touring bike's fit dialed-in this afternoon, and was not having any luck. I really want to turn it into more of an upright around town bike anyway, so I was thinking either a moustache or nitto albatross. I've got a nitto dove on another Peugeot, and I love it, but that model doesn't accommodate bar-ends. Last edited by sunburst; 07-19-09 at 01:48 AM. Standard old French handle bar clamp size is 25mm, but they are often a bit larger. That means that any mountain-size bar can be persuaded to fit a French stem. To make a 22.2 mm stem fit a French stem, you have to remove .1 mm of material. It would take hours if you use 400 grit. Something like 240 is more like it. Protect the part that will show with duct tape while you're sanding. A 1/4 sheet sander can speed the process. I've done at least six of them, all of them Nittos. OK, this explains a lot. I spent hours (unsuccessfully) trying to get a 26mm bar into a french stem ('75 peugeot), even though this same bar squeezed into a 25.4 stem (a Performance mechanic did this, which I later learned is a no-no). I eventually put the original french bar back, which was odd looking, a 38cm bar on a 65cm frame. I put a mt. bike riser on my Peugeot fixie, and it easily fit. Thx, for the 1/4 sheet sander tip. Don't know why I didn't think of that. Success! I taped it, then spent about 30 min with a fine metal file to reduce the stem from 22.2 to 22.0. Then I sanded for smoothness. Any opinions on taking the same approach (with a round file of course) to increase the clamp from 25.4 to 26 (different stem, this time)? Anyone recognize this stem? It had a 22.2 body (before filing) and 25.4 clamp. Oh yeah, and it has a round/cylindrical expansion bolt (french design? ), rather than a wedge.